My very first news reporting job at The Ridgewood News in northern New Jersey was a good one, as I had to cover anything that came my way. One such story was about then Ridgewood High School gym teacher, Jack Elwood, who had then (2003) been diagnosed with amyotrophic lateral sclerosis (ALS), a fatal disorder that causes degeneration of nerve cells in the brain and spinal cord. ALS is commonly referred to as Lou Gehrig’s disease. I met him at outside on the school grounds one day, as he was leading a freshmen gym class through a ropes course, where the lesson included a great deal on trust. Here was this guy, totally dressed like a gym teacher, with a whistle around his neck, calmly telling me that the ALS would first take his hands, and that within four to five years, he’d be wheelchair bound. And then he’d die. It was a tough interview for a new reporter. I remember having this awkward half smile as I took notes and continued to ask questions. He was a genuinely nice man and it showed. His students loved him, and it was their first year with Jack as their teacher. Mr. Elwood passed away in 2010 and any time ALS comes up, I think of his brave outlook on a disease that affects so many. 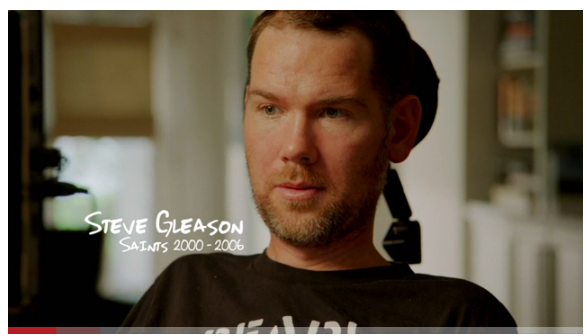 ESPN recently aired a touching segment involving a former NFL player, Steve Gleason, who is fighting ALS, the band, Pearl Jam, who Gleason is a big fan of. The sports network arranged for the Seattle-based band to visit with Gleason, an ex-New Orleans Saints player, who has loved Pearl Jam’s music since he was a teenager.